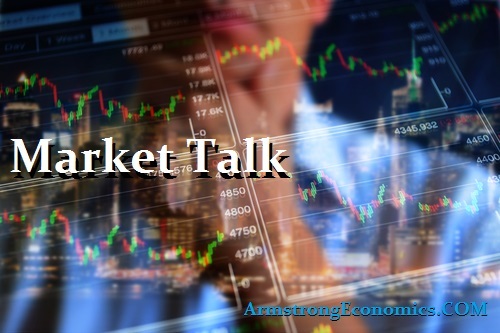 European markets just appear to be headlining, watching after the UK’s decision on Wednesday with economic data substantiating the nervousness. UK GDP was marginally lower than previous, therefor cable lost the morning bid but had been reversed in the afternoon with talk of large trades out of the EURO and into GBP. Core indices (DAX, CAC and IBEX) closed around +0.5% firmer on the day while FTSE lost similar percentage on the downside. The weekend press and going into next week will all be about Brexit and the severity of the deal they manage to negotiate but considering this will extend for the next two years, this could get tiresome! It ended with a poor week but as a whole it has been a rather impressive Q1. On average the three major indices closed around 4.5% higher with the NASDAQ the best performance in over four years. The inflation data was marginally worse than anticipated which helped the long end of the treasury market recoup earlier intraday losses but still remained below yesterdays trading range. Late in the day the Chicago PMI came in a little higher than the 56.9 expected at 57.7 but as it is month end volumes were light and prices a little sketchy. One of the main talking points through markets today is the meeting between US President Trump and Chinese Premier Xn the end of next week. This could be interesting even if we just watch headlines before they shake hands.